I think I was a youth many years ago but I can’t be sure. I remember going to youth clubs and once trying rhythm gymnastics so I must have been. When I had two offers to volunteer with some of the young people of Droylsden I was ready to see what had changed over the years and how volunteers can help. I had been invited to join Sharon at Fairfield Juniors Youth Club on a Tuesday evening after I’d met her at Active Tameside so I was happy to pop in. The youth club has subs of £1 that go towards a snack and is for young people aged between 8-13. There is a tuck shop for extra treats and lots of different activities going on in each room. Sharon started the youth club with some other parents for her own children but by the time the club was up and running her children were too old. This hasn’t stopped Sharon from continuing to run the club. Some of the volunteers are friends of Sharon’s and others have children who attend. In two cases the volunteers have gone on to get jobs with young people elsewhere but they return to help out. A volunteer Paul was playing sports in one room, there was snooker and crafts in the main room and in one of the back rooms there was a young volunteer who was teaching dance, drama and singing. It was lovely to see people doing their own thing and yet everyone was included and they looked like great friends. A big highlight was when the young people rushed in for their snack to discover it was chips this week. The volunteers set the room up, took subs, made the snack and cleared up but apart from that the members got on with the activities they wanted to. There comes a time when young people want to spend more time with their friends than adults so it is nice to see them making friends and having fun led by their own wants and needs. Volunteering sometimes meant just being there to help with activities or the occasional disagreement. 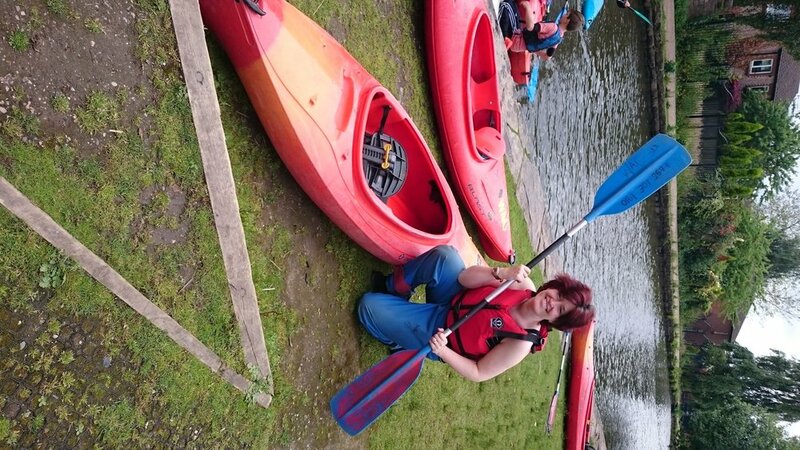 I then went to a youth club with a difference at the Water Activity Centre. Sunday Funday is a group for 8 to 14 year olds based around water. Just like FJYC there are lots of different activities from art to sports with the addition of water activities on the canal. Sheila and Steve were running the day and I helped Shelia with the subs so I could get to know the young people. They pay 30p and are encouraged to bring a pack lunch, a towel and a change of clothes. I was there to help get into a packed lunch or have a quick chat. They were happy to talk and I got more of a hang of the idea of a youth club by letting the young people decide what they wanted to do and just help when it is needed. They lead they own play and decide want they want to do. After some trust was developed I helped some of the girls with their life jackets and getting their boats in the water. Many of the boys were on a surfboard. Some wanted to use the canoes and kayaks, others just jumped in straight away. Steve and I took to the water and it wasn’t long before one of the boys was hanging off the end of my boat. I was happy if I got knocked in but it didn’t come to that. I loved being on the water; it was beautiful and peaceful, even with the shouts and splashes. I remember the canal from my childhood and what I was witnessing was real freedom and the joy of being young. Playing in nature with your friends in a safe environment is something these children and young people will remember forever. We had sunshine and rain and no one cared. Jet, a volunteer, was running T shirt making indoors and the young people ended the session deciding what they wanted to make next week. Some of the volunteers were on Duke of Edinburgh awards or completing NVQs in Youth Work. Even if when we were young is getting further and further away it is still a part of us. Being with young people can bring those playful elements of us out and help us to connect with fun and freedom and give them the best possible start in life.